This past Monday, October 30th, Prof. Ania Loomba and Prof. Nelson Maldonado-Torres participated in a public conversation coordinated by Prof. Anjali Nerlekar with the support of the Comparative Literature and South Asian Studies Programs. The title of the conversation was Anti-colonialism and its trajectories: Postcolonial and decolonial thought, where both professors spoke of their professional trajectories and how they intersected with postcolonial studies and decolonial thought. Both had different ways of presenting their main arguments leading to a lively and dynamic conversation, provoking occasional laughter or thoughtful looks and speedy note-taking. The framework of the conversation was the course offered this semester by Prof. Nerlekar Introduction to Literary Theory, where graduate students discuss leading theorists and aim to establish a theoretical framework for their own projects. With this in mind, Prof. Maldonado-Torres decided to move beyond the texts and trace his interactions with postcolonial studies. He began with an anecdote of how his anglo-American writing tutor in graduate school suggested that he must know postcolonial studies, leaving him feeling a bit perplexed about the assumption, and marking his first contact with its authors and theory. Moreover, he pointed out that postcolonial theory helped him frame a response to the provincialism of Western philosophy and a critique of the eurocentrism present in Puerto Rican nationalism. Similarly, Prof. Loomba was told to read postcolonial authors by a fellow academic, once her PhD studies had been completed in England. In speaking of her own trajectory she explained her parents were Marxists, described herself as a political child and a feminist from the second wave of feminism in India. It was in England that “I discovered race for the first time and realized how terribly colonialized I was, the peculiar thing in India is that you don’t see race, which now I would say is exactly the coloniality we were all taught”. However, both argued that Postcolonial theory has limitations that may be pushed further. Prof. Maldonado-Torres focused his critique on four general limitations; it did not fully address eurocentrism, it was a theoretical movement that wasn’t grounded on current social movements, and it excluded lived experience. He tied his final critique with his own analysis of Puerto Rican nationalism, “I realized that the provincialism of Puerto Rican nationalism was matched by the complicity with colonialism of forms of knowledge that used criticism as refuge of the closed forms of repression”. Prof. Loomba responded first by emphasizing that she is not a postcolonial specialist, and that the work she has published on postcolonial studies has been as someone who uses this theory and engages with it in a critical way. She further pointed out that she would separate Edward Said from the other theorists, however, she used him to point out how postcolonial theory sometimes simplifies its analyses by not including the “traditions of patriarchy, race structures, and class structures that predated colonialism”. Both professors closed their discussions by presenting their own proposals on how to engage with both the limitations and useful elements of Postcolonial Studies. Prof. Maldonado-Torres discussed his work in area studies, spoke against what he termed “the infantilization of area studies”, and supported the project of an academy linked to social movements. He then presented the background of the end of the Cold War and indigenous movements in the 90s as key for leading to Anibal Quijano’s term of coloniality and “to the notion that modernity and coloniality are a global system of power that orchestrates relations between different countries but also inside the different countries”. Prof. Loomba framed her response by pointing towards elements that should be rescued, such as the idea of multiple histories. However, she stated postcolonial studies were too presentist, and didn’t go sufficiently far back in their analyses. She also spoke against the American academy’s obsession with creating new fields and asked to move beyond the term ‘postcolonial studies’. She strongly urged for an inclusion of ideas that are emerging within the Third World and not use the same 4 or 5 authors, “that are taken up by American presses and canonized here”. At the end of both presentations, there was a short question and answer session. One example of a question that came up focused on how this discussion might translate into pedagogical tools or strategies to bring decoloniality into the classroom. Both professors answered by stating two options: the first focused on strategies in the classroom, such as, working with students on a more horizontal level and leading creative efforts within the classroom; the second focused more on content, bringing in authors that are not generally discussed in American academia or constantly integrating discussions surrounding race and/or gender into courses. Both professors ended the conversation leaving the room buzzing and inspired to productively question our own colonialisms/colonialities. On March 3, 2016, the graduate students of the Rutgers University Program in Comparative Literature held their biennial conference. This year’s conference, titled “Urban (De)Coloniality and Literature,” sought to push back against what we (the co-chairs) thought was a limited reception of the project of decoloniality within literary studies (e.g. that the project is geographically restricted to the Americas, temporally restricted to the 15th and 16th centuries, and heavily dependent on Hispanophone contexts). We also wanted to uphold comparative literature as an institutional space within the U.S. university where divergent forms of knowledge production can meet to analyze a specific issue of social relevance. 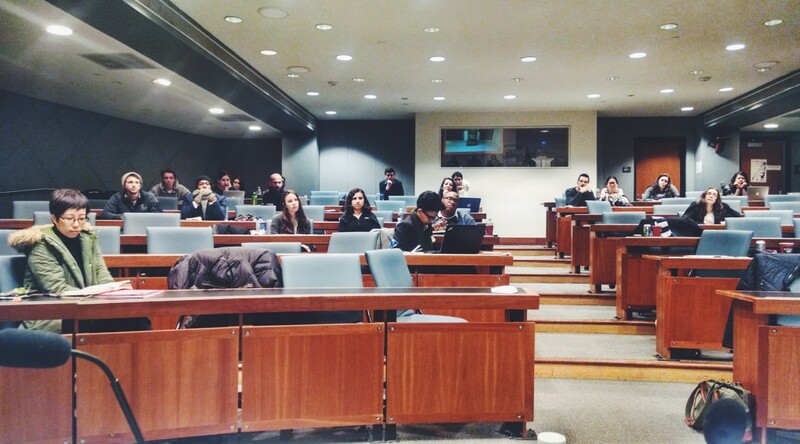 The conference participants brought together ethnic studies, women and gender studies, area studies, philosophy, history, anthropology, religious studies, indigenous studies, as well as literary and cultural studies. They were invited to focus on an aspect of coloniality that in our view remains understudied: the coloniality of the city, as reflected in patterns of gentrification, mass surveillance, and the criminalization of racialized populations. The first panel, “Remapping the Urban and Reclaiming Lives,” examined different decolonial imaginaries emerging from urban settings, ranging from San Francisco’s Mission district’s Chicanx public art, French-colonial plantation cities and Maroon utopianism, and Canada’s settler-colonial urban space unsettled by the Idle No More movement of First Nations peoples. Cynthia García (Stanford), Fadila Habchi (Yale), and Allyse Knox (Stony Brook) challenged the colonial intensifications of these urban spaces and offered for our analysis the multiple media through which a decolonial reclamation of the city might take place. As the panel’s discussant Professor Dinzey-Flores (Rutgers) highlighted, the physicality and materiality of space serves as a necessary context to analyze this endeavor. The second panel, “Genealogy and Decolonial Epistemology,” brought together different trajectories that have inspired decolonial work: Native kinship and intimacy, the moment of Pachakuti (rupture), and Black women’s creative (“demonic”) possession of space. Invigorating and also challenging other genealogies of decoloniality, Nicole Eitzen Delgado (NYU), Gabe Sanchez (Albany), and Alexandria Smith (Rutgers) demonstrated the contribution of wide ranging theoretical and practical sources to decolonial thought. 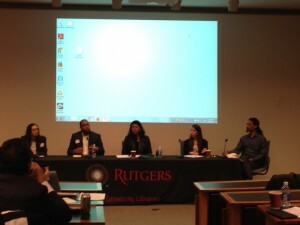 Comp Lit’s very own Professor Yolanda Martinez-San Miguel (Rutgers) was this panel’s discussant. Raising the methodological question of comparison vs. relationality, she urged us to attend to the fundamental opacity in this epistemic endeavor. The third panel, “The Anthropological of the Inter-Space” further reflected on interdisciplinarity as the discussion focused on how anthropological subjects get created in in-between-spaces. Spaces considered were the New World, Okinawa’s military bases, and taxi dance halls in the 1920’s U.S.A. Dana Francisco Miranda (Connecticut), Ariko Shari Ikehara (Berkeley), and Monica Stanton (Princeton), pushed one another to address different time periods and modalities of control and invention in inter-spatial contexts. 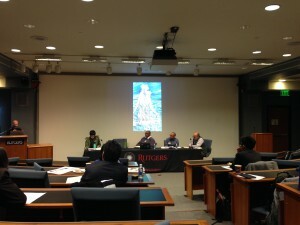 Professor Carter Mathes (Rutgers) traced “Man as the glue to anthropological normativity” in all three papers and offered additional contexts to consider, such as the (super/sub)human otherness of racialized subjects, as seen recently in Darren Wilson’s description of Michael Brown. The last panel, “(De)Colonial (Ab)use of the Theological and the Spiritual,” both credited and challenged secular and non-secular foundations of decoloniality. Lucas de Lima (UPenn), Foster J. Pinkney (UChicago), and Daniel José Camacho (Duke), traced queer, anti-violent, and indigenous deployments of liberation theology and spiritual practices. Their papers illustrated the importance of furthering a critique of both secularism and of theology’s complicity with coloniality in a global and comparative/relational perspective. 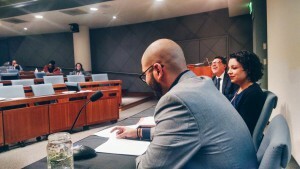 Professor Carlos Decena (Rutgers) offered an intense and provocative discussion on the limits of theologies of liberation and the need to further look at their often covered over queer underside. Professor José David Saldívar (Stanford) was the conference’s keynote speaker. His talk, “Negative Aesthetics and Junot Díaz’s The Brief Wondrous Life of Oscar Wao,” proposed that a negative aesthetic found in Díaz’s work helps explain the global presence of U.S. ethnic literature. Professor Saldívar began by sharing his on-site research in New Jersey since Díaz himself lived in Parlin, NJ, and attended Rutgers College as an undergraduate. 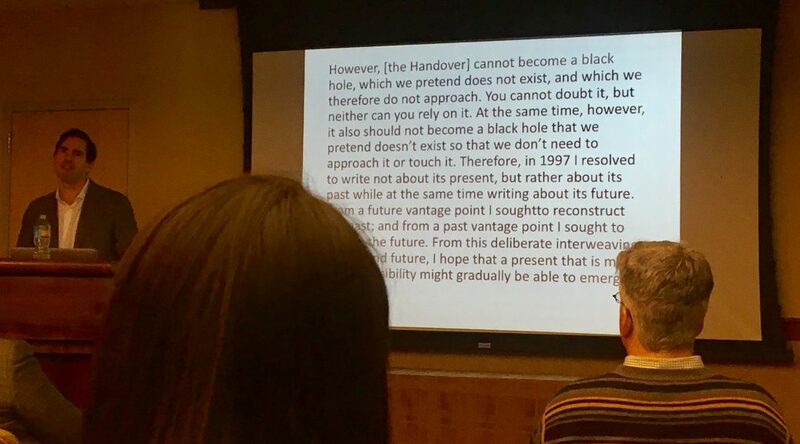 Rutgers Comp Lit graduate students Carolyn Ureña and Enmanuel Martinez offered responses to Professor Saldivar’s talk. The ensuing discussion touched on Dominican Republic’s place within the modern/colonial world as well as the relation between the concepts of americanity and coloniality. 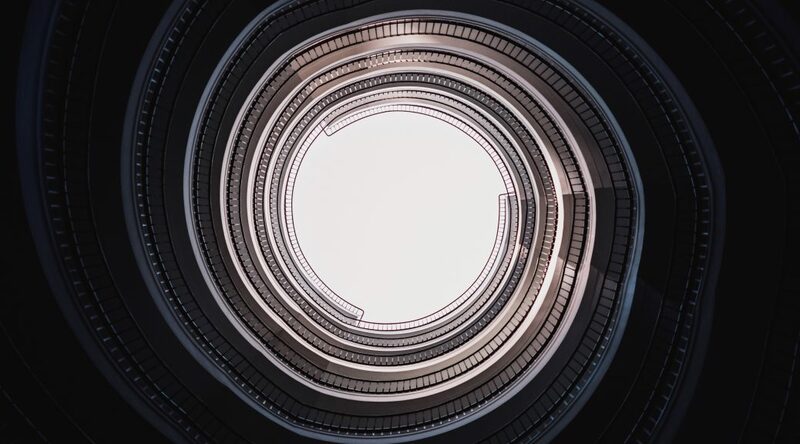 The critically interdisciplinary exchange the conference generated reflexively encourages us to expand the theoretical frameworks of comparative literature as a discipline. Moreover, it urges us to expand the scope of decoloniality as a critical-intellectual project connected to social movements throughout the world. 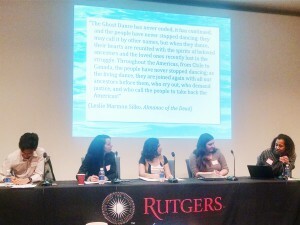 As Rutgers celebrates its 250th year anniversary, the themes of this conference also speak to Rutgers’ own colonial history and the ongoing gentrification of New Brunswick. Committed to various communities and projects, the conference presenters and participants were able to use this conference as an occasion to share research and insights across disciplinary boundaries and physical distance. 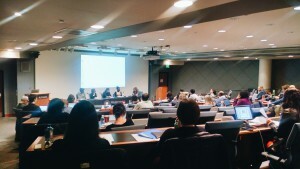 The conference gave all of us a glimpse of the exciting work of emerging scholars, work that speaks to many of our current predicaments and signals a new generation of researchers who seek to challenge existing modes of thought and stimulate new conceptual frameworks and social movements. We would like to once again express our deepest gratitude to all presenters, organizers, discussants, administrators, and university staff, without whom the conference could not have materialized. The same goes for our sponsors: The Rutgers Graduate Student Association, The Centers for Global Advancement and International Affairs, The Program in Comparative Literature, The Department of Latino and Caribbean Studies, The Department of Asian Languages and Cultures, The Advanced Institute for Critical Caribbean Studies, and The Department of African, Middle Eastern, and South Asian Languages and Literatures.